One of the current hot topics in the world of video gaming is whether or not Japanese developers are still relevant in an increasingly Western-dominated industry. I am never quite sure exactly what is meant by “relevant” (sales? quality? 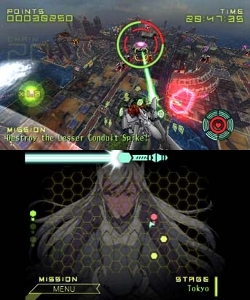 ), but I submit this for your consideration; until the West makes a game where you play as a high school girl elected president of your country who must then travel around in a huge flying robot liberating said country from its enemies, Japanese developers will continue to remain relevant to my gaming needs. Take that, Call of Duty clones! Sure I’ll save Japan, right after I study for midterms! I can try to expand on the plot a bit, but there really isn’t that much more to say. The star of the show is Shoko Ōzora, a high school student who is elected president of “New Japan” after the assassination of the previous president, her father, by occupying forces. For reasons that are never quite explained (other than, you know, “it’s Japan”) her role as president demands that she single-handedly defeat the occupying forces with the help of the Kaihoki Kamui (the “Liberation Maiden”), a giant mech. And something about freeing the spirits of Japan as well. But really, other than some short and occasional cutscenes, there isn’t that much in the way of plot in Liberation Maiden. 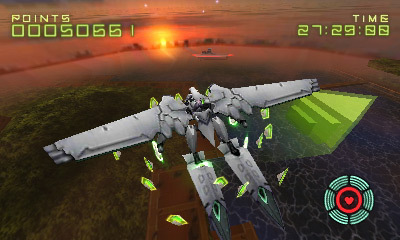 Liberation Maiden is basically a free-roaming 3D SHMUP, although, except for the boss fights, the limited controls and camera take away the verticality for most of the game, so it often plays more like a free-roaming 2D SHMUP. The controls are easy enough to pick up; use the analog stick to move your mech around, the L button to strafe, and the touch screen / stylus to aim. Your initial weapon is a set of missiles which can be targeted to multiple enemies by sweeping the stylus across them, and then launched when you release the stylus. There is a bit of risk / reward here because your missiles are also your shield, so the more that you launch at once, the more open you leave yourself to enemy attacks. There is one other ranged weapon that you will acquire early into the game, as well as a special sword attack that will have you swiping the touch screen and a context sensitive attack that will have you spinning circles on it. Whether these kind of touch-oriented controls will still interest you years into the life of stylus-based gaming will be up to personal preference; personally I like the added touch. I had some issues with the camera angles being a bit wonky at times, and some some inexplicable reason you can’t strafe and turn at the same time, but for the most part the simplicity of the camera and controls lend themselves well to the game. And then Liz passed me a note that said Matt likes me, but... oops, gotta go! It’s clear that a higher level of effort was put into the presentation of Liberation Maiden than many 3DS eShop releases, which may be accredited to the fact that it was originally part of a retail release. Liberation Maiden boasts some excellent, stylistic anime cutscenes (from the animation studio behind the Cowboy Bebop movie), although, as stated above, this is not a heavily story-based game, and the cutscenes are fairly short and mostly just exist as introductions to the various stages. The in-game, 3D graphics are perhaps not quite as impressive on a technical level, and certainly don’t compare to something similar like Kid Icarus: Uprising, but they have enough style to get the job done. The soundtrack and effects are pretty solid too, although they didn’t really stick with me outside of the game. Essentially, on the presentation level, this is a well done anime-style game, which is much appreciated by an anime fan such as myself in an increasingly Westernized Japanese industry, but it doesn’t really bring much new to anime-style presentation either. 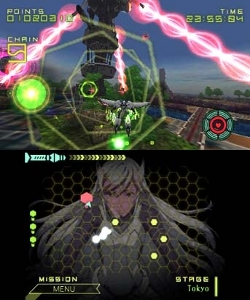 The gameplay of Liberation Maiden is, as stated above, of the SHMUP variety. The ultimate goal in each stage is to destroy a “greater conduit spike” (i.e. 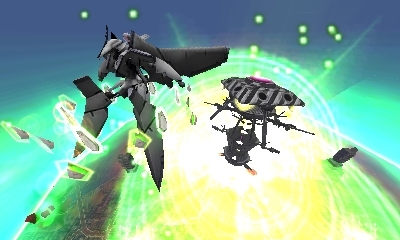 a boss), each of which takes on its own unique form with its own unique attacks. Before this can be accomplished, however, you must first remove its shield by tracking down and destroying several “lesser conduit spikes” (mini-bosses? ), which are feeding it power. In addition to destroying the lesser spikes, you are often given other missions such as destroying a fleet of battleships, disrupting enemy supply trains, and covertly infiltrating a base by avoiding security sensors. There are also some optional missions within each stage that you can choose to take on if you please, although these are pretty limited in scope, so don’t expect a brand new experience on each playthrough. All of this gameplay is tied together by waves and waves of enemies and projectiles to attack and dodge. 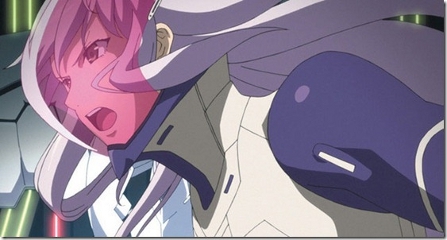 Liberation Maiden, like most SHMUPs, is a pure, unrelenting action game at its core. My guidance counselor said I should become a writer. And then I did this instead. You were expecting another comment about her being in high school here, weren’t you? Excellent review! I do love this game, frantic action and pure Japanese insanity at it's best! Even the length doesn't bother me, I got about 4 or 5 hours of enjoyment out of it and that's fine for an $8 game. @deathly_hallows Did you play through it multiple times or do the stage attack? Or both?! I played the entire game through twice, and messed around with the stage attack a little. The 2nd playthough was much more fun IMO, because I knew what the hell I was doing and it felt natural, it took me a while to truly acclimate to the controls the first time through, I feel like I fumbled my way through a lot of stages. Now when I play I'm like a surgeon, a precision death-machine! one of my favorite games of the year. Going to a movie is like $12 nowadays. I don't have much problem with paying $8 for this 2 hour game. I think it's got a high replay value, and it definitely has the production values to deserve its price tag. Yeah but that's why I rarely go to movies! It does have replay though, I did some time stuff and started up a hard mode game. A short game length can be disappointing, but it also increases the likelihood of me replaying it by a lot. i rarely replay games because i have a ton and not enough time to go through all i have even once. but a really good short game? i'll play that a couple times. shorter games with little fluff or downtime are actually MORE appealing to me. i think too many games are way too long because of unnecessary ideas, complexity and systems. I should get back to this one. I couldn't get the feel for the game initially. It never felt like I was playing it correctly. I'll boot it back up sometime this week and give it another shot.